There is this book I ordered on Amazon two months back. I sort of picked it on a whim. Quickly scanned the reviews and hit the ‘add to cart’ button. I was so delighted looking through this beautiful book for the first time when I got it in the mail. I’m talking about Tea with Bea. Now I know the title might sound a bit cheesy perhaps, but don’t judge a book by its cheesy title. The author of the book, Bea Vo (of Bea’s of Bloomsbury), not only writes the book in a way that it is easy to understand, but also gives specific background information about chemical processes (what not to do and why). As you can maybe tell, I am really excited about this book and would highly recommend it to anyone who likes/loves to bake! If only to look at the beautiful pictures of the cakes, cookies and… cheesecake. I’ve made a fair amount of cheesecakes in my day (gosh, that makes me sound old- I’m 25; honest!). My favorite is still a New York style cheesecake topped with cherries. In my mind, I would never have imagined chocolate and cheesecake go well together. I thought the rich chocolately taste would clash with the slight tang of the cream cheese. But guess what? Good news. I was wrong! And this cheesecake is a must try, as it is so creamy and silky with just the right amount of sweetness. 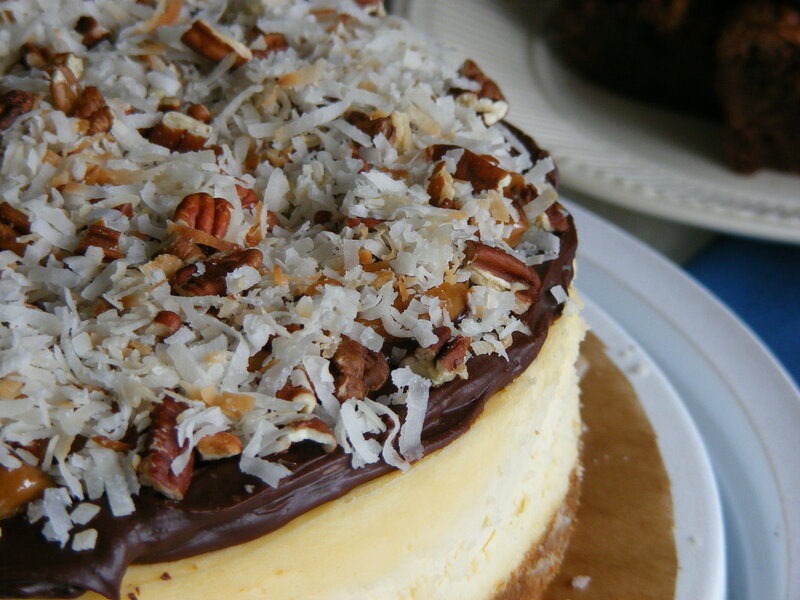 And if chocolate and cheesecake weren’t enough, this recipe includes toasted coconut, pecans, dulce de leche and drizzled melted chocolate. Preheat oven to 125 C (140 F); fan forced. To make the crust, crush the cookies/biscuits until you get a fine crumb (a food processor with blade attachment is easiest). Add the melted butter. This will be variable depending on the type of biscuit and butter. Test it by grabbing a bit of the mixture and squeezing into your hand to make a ball, then releasing your hand. The mixture should hold its shape, but also fall apart when touched slightly. If it doesn’t hold it’s shape, add more butter other wise the biscuit will dissolve into the cheesecake and you’ll have no crust. If it holds its shape too well, add more biscuits/crackers to absorb the butter, otherwise the crust will be too hard. Press the mixture into the prepared cake pan and pat down until level. Put the cream cheese and sugar in a bowl and beat until well mixed and the sugar has dissolved. Slowly incorporate the eggs, one at a time, beating until thoroughly combined before adding the next. Scrape the side of the bowl regularly to make sure everything is incorporated. Sift the cornflour/cornstarch into the mixture and stir until thoroughly combined. Add the cream and vanilla extract and mix until combined. Pour the mixture into the cake pan over the crust and bake in the preheated oven for 1 hour until the middle is slightly jiggly and the top doesn’t look shiny or wet anymore. Remove from oven and let cool in pan for 1 hour. Refrigerate overnight. Unmould the cheesecake by turning it upside down on a plate or board, then uprighting again. I always use two cutting boards, which works really well. To make the fudge frosting; put the cream and golden syrup in a medium saucepan and bring to a boil. Put the chocolate in a large bowl (preferably not plastic, but metal or glass). As soon as the cream and golden syrup reach a boil, immediately turn of the heat. Pour it over the chocolate and let it sit for 1 minute. Using a small whisk, stir with very small motions in the middle of the bowl. This will take a while. The point here is to make an emulsion, by incorporating small amounts of cream to the chocolate. After 5 minutes start stirring in slightly wider motions. Continue stirring until the mixture is very thick and glossy and until fully combined. Add the vanilla extract and the butter and mix until well combined (don’t leave the small buttery bits; keep stirring until smooth again). Set aside to let the chocolate stiffen into a firm consistency. Do not refrigerate! It will turn very solid and will not be spreadable. 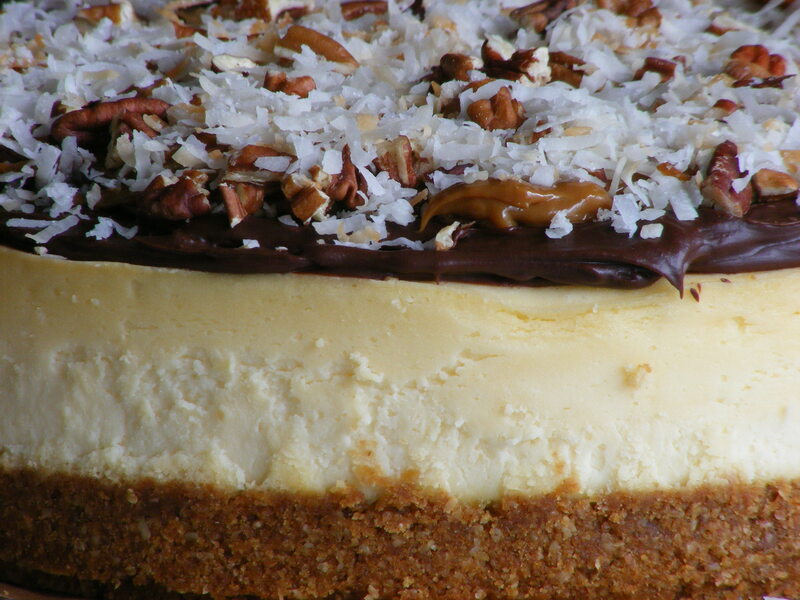 Spread a layer of fudge frosting over the cheesecake. Warm the dulce de leche slightly in the microwave for 20 seconds, and drizzle over the fudge icing in dollops. Sprinkle with toasted coconut and pecans and some melted chocolate all over.